Note: We’re thrilled to have Drew Fairservice join the FanGraphs team of writers. He’ll be contributing here on a regular basis, and we think you’ll like him a lot. In the run-up to the trade deadline, we read countless reports of team X sending scouts to watch player Y’s next start, a standard baseball practice which seems weird because it isn’t as though Jon Lester, David Price, et al are unknown commodities. Why go watch them? What could scouts possibly see in a handful of July starts that might sway any decision to acquire such proven big league talent, especially on a rental basis? Our projection systems provide a snapshot of the potential gains grabbing such a player delivers between the deadline and the end of the season. Using the available means, we roughly figure the Tigers can expect a couple wins from Price in the regular season over Drew Smyly. When we post rest-of-season forecasts for players on new teams, it’s a matter of distilling the true talent of a player and then adding the context of their new home. But there can often be impediments to this true talent, roadblocks that could prevent a newly-acquired player from producing for his new team as they expect. Trained eyes might notice a pitcher consistently failing to get a key pitch to certain spot, or making up quick fixes in an attempt to address these challenges. Perhaps an unreported injury is shortening up a stride or a pitcher is tipping his breaking ball. Especially in the context of rental players, this is key. As much as hot streaks and slumps are more about randomness and round balls bouncing off round bats, there are dynamic elements that can hinder performance. There are so many moving parts and timing-based elements when hitting or throwing baseballs at the game’s highest level, at some point things are bound to get out of whack. Sometimes regression doesn’t have time to ride in on its white horse to save the season. Consider Brandon McCarthy, now of the New York Yankees. 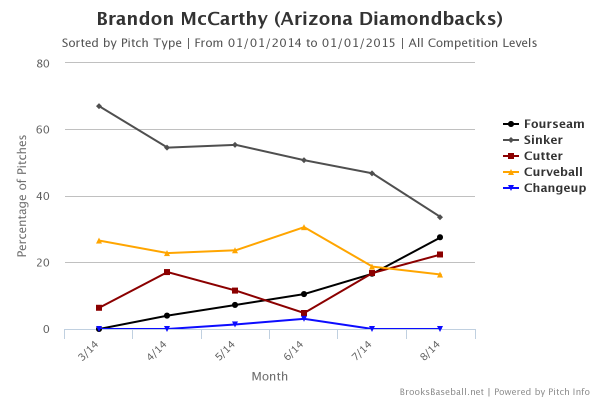 As you well know by now, McCarthy’s results were terrible as a member of the Arizona Diamondbacks. His peripherals looked fine but he was plagued by the long ball. Put the guy in pinstripes and suddenly McCarthy’s a new man! Except he’s basically the same man, with the same strikeout rate, walk rate, and ground ball rate since moving to the American League. The only difference is the lanky righty’s ability to keep the ball in the park; no mean feat at Yankee Stadium. McCarthy credits the Yankees staff for encouraging him to throw his cutter again, a pitch the Diamondbacks wanted him to move away from, according to McCarthy. As a Yankee, he’s thrown more cutters and four-seamers while reducing his sinker & curveball usage. If the Yankees scouts noticed something in his approach and believed they could correct it, then consider that removing a roadblock. The results are definitely promising, and could absolutely be a product of his new approach. Or it could just be a matter of giving up fewer homers because he was bound to give up fewer homers. As much as the cutter might keep balls off the barrel, there is that nagging fear that this is not better process, just better results. It’s a chicken-and-egg situation for the ages. Did McCarthy get better because he was bound to get better or did he get better because the Yankees helped unlock the efficient pitcher he became in Oakland? It is just this kind of complicated exercise in logic that teams must consider before deciding to make a move with the playoffs in mind. Can we afford to gamble on this player, based on our information? It works the other way, too. The rapport built between Jon Lester and David Ross helped to bring out the best in the big lefty, but Ross’ skills as a pitch framer certainly didn’t hurt either. Did the A’s account for this boost and how their stable of catchers might affect his performance? Is he outperforming his abilities and how hard might he crash? For a pitcher of Lester’s quality, probably not much. As much as the extra strikes Ross managed to steal, Lester’s more aggressive approach deserves credit for his great 2014 thus far. As he told me in July, “screw everything else, we’re going to challenge guys.” A concerted effort to pitch differently yields better results – an outcome the A’s can certainly live with. At this point, the Yankees can only be happy with the quality of McCarthy’s outings and less concerned with how he managed to pull it off. Whether or not they believe the gains he shows in this tiny sample is a conversation for the off-season, when it comes time to consider re-signing Twitter’s favorite pitcher to a multiyear contract. We can chalk a lot of this early success up to regression and the power of numbers like xFIP, but the without the fundamental changes brought about by an informed scouting and coaching staff, does McCarthy turn it around so quickly? Is regression to the mean simply the variance working itself out, or is it the inevitable result of a player fixing something that was previously broken? Untangling these connections is complicated, and it’s unlikely that even the Yankees know how much credit to give to the changes implemented for his success in New York. But given their acquisitions over the last month — McCarthy has been joined in New York by Chase Headley, Stephen Drew, Martin Prado, and Chris Capuano — it’s pretty clear that the organization likes to try and buy low on guys whose results don’t line up with their underlying peripherals or their past track record. So far, it’s worked out pretty well for them. Whether it’s tinkering or regression, either way, it looks like a pretty good plan. We hoped you liked reading Brandon McCarthy: Tinkering or Regression by Drew Fairservice! Couldn’t be happier to see you land with Fangraphs! I’ve been reading your work since the early Ghost Runner on First days and have always enjoyed your writing style. The work that you, Parkes and Stoeten did since the early days helped reignite my passion for baseball and the Blue Jays.